Send this Hanukkah gift basket to anyone celebrating this Jewish holiday. 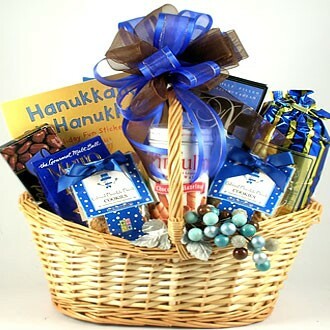 Hanukkah gift baskets are a welcome treat for any Jewish family during Hanukkah. This beautiful gift basket, full of gifts and gourmet goodies, will be a welcome treat for their family during Hanukkah! Help them celebrate Hanukkah with this scrumptiously wonderful gift basket.